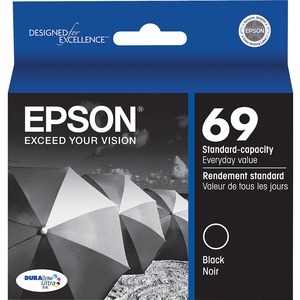 Ink cartridge is designed for use with Epson Stylus C120, CX5000, CX6000, CX7000F, CX7400, CX7450, CX8400, CX9400Fax, CX9475Fax, N11, NX100, NX105, NX110, NX115, NX200, NX215, NX300, N305, NX400, NX415, NX510, NX515; Workforce 30, 40, 310, 315, 500, 600, 610, 615 and 1100. DuraBrite Ultra Ink offers superior image quality with smudge-resistance, water-resistance and fade-resistance for durable prints. Excellent for double-sided printing, DuraBrite Ultra ink does not bleed through and is quick-drying for worry-free handling of photos. Acid-free ink produces rich, vibrant colors.